Can you identify these lights? No identification anywhere. They seem to have died and I'd like to replace the bulbs. Can you open them up and look at the bulbs? An auto parts store should be able to match them up. Also, are you sure it is the bulbs? It is unlikely that they both went out at the same time. I would double check that you are getting power to them. +1 to Mike. Motolights. Have a lifetime bulb warranty or you can buy replacements at Lowes/HD - either standard or LED. There should be a tool for turning off the front sealing rings. There should also be an egg shaped switch for turning them on and off. Misplaced the spanner wrench to change a bulb and I "think" they sent a free replacement. I agree simultaneous burnouts would be unusual. So I removed the left fairing and traced the wire harness. During this extensive 12K maintenance and upgrade project, I had disconnected the battery. When I reconnected, I attached all blacks to NEG and all reds to POS. Turns out the Motolights harness uses a black wire for power. Duh. Thanks for tweaking my thinking. cws and Voyager like this.
. When I reconnected, I attached all blacks to NEG and all reds to POS. WARNING, not all blacks go to ground. The starter line from the relay is black, the three lines from the reverser controller are all black but they have a colored sleeve at the eyelet. 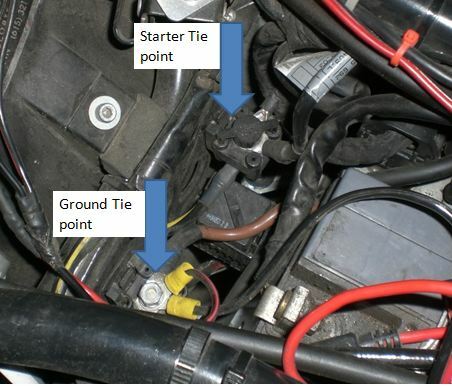 Red sleeve goes to battery +, Brown sleeve goes to grounding tie point, Black sleeve goes to starter tie point. Here are the tie points. Negative is usually Brown on BMW. Exactly. 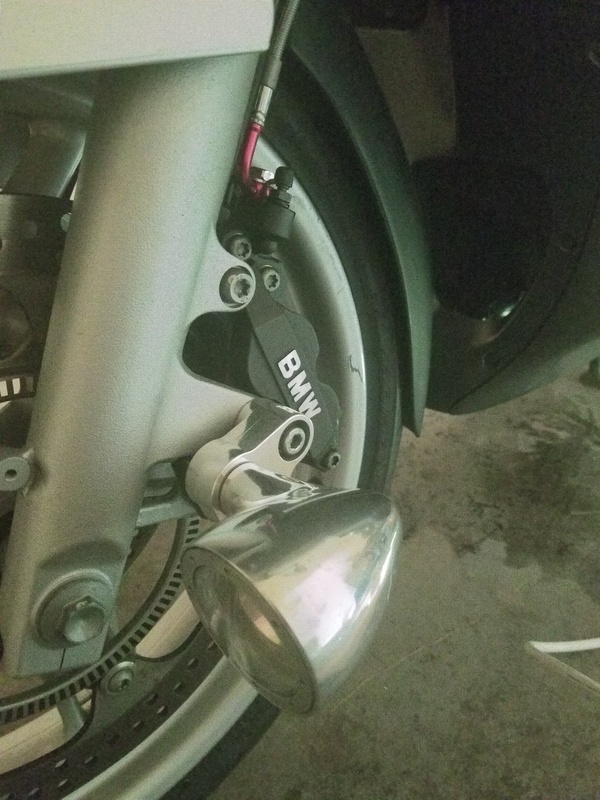 That was one of the first things that I installed on my bike. So nice and clean. I like that you can do a switched or "always on" power source. Voyager and Munmi like this. These Motolights look awful next to my upgraded H7 35W 4300 HID. Motolights offers an LED uprade for them, for $140. "Much brighter" - but no specs that I could find. Have any of you tried this upgrade, and were you satisfied with the match to your headlight? You can buy replacements at Lowes/HD - either standard or LED. Much less $$ than motolights. I did buy new from HD. The brightest they had were 750 lumens. They are barely brighter but they are incandescent and just as yellow. Maybe lower lumens but LED would get me better color? Last edited by jzeiler; Apr 14th, 2019 at 4:38 pm. Will they be plug n play, or will I need more load resistors? Plug and Play as they are not part of the bike's system. The only thing the Moto Light replacement bulb are good for is the narrow beam of the light. Most of the ones at big box are floods. There are some good bulb places on the web with narrow beam MR-16s. I had reported MR-13 previously in error. I am running Oshio MR-16 50 watt halogens with a 12 degree beam, one clear and one orange for an "odd-eye" look and find them very bright. Last edited by jzeiler; Apr 14th, 2019 at 4:44 pm. As John notes and I concur you will most likely not find the "correct" LED bulbs at big box stores since they they are for display - wall and furniture floods and have very wide beam angles. BTW your Motolights are an upgrade since they are polished aluminum. Also check to see if the wiring attachments are routed correctly and are sealed as they have been known to fill up with water - ask me how I know!! One other point these LED bulbs will not out perform the 65W halogens in providing you down road light. A few years back I did a side by side test at the Motolight warehouse in Cincinnati - what they will do is come close to matching the color of your LED headlamp and provide a great light triangle for conspicuity. Good luck in your search . . .
Last edited by dfinazzo; Yesterday at 8:16 pm.